Depending upon specific application requirements, Diamond offers dedicated connectors that support higher optical power at fiber-to-fiber or air-to-fiber transitions. Different techniques can be applied in order to increase the spot size and consequently decrease the optical power density at the interface, which reduces the risk of reversible or catastrophic failures due to thermomechanical effects. SM fibers are end capped with a GRIN lens that expands and collimates the fiber’s mode field at the connector’s interface. When mated, PS connectors can sustain much higher optical powers while maintaining exceptionally low loss levels. 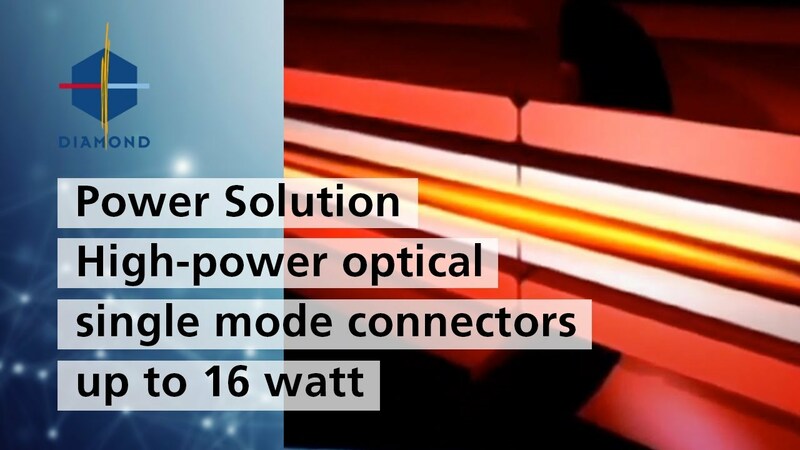 For polarization sensitive applications combined with higher optical powers, Diamond offers a beam expanded connector based upon an integrated GRIN lens spliced to the PM or PZ fiber. The collimated beam output allows for a low loss, seamless connection to an identical PM-PS connector. The polarization state is maintained across the interface through a proper orientation of the connectors with respect to the fibers’ optical axes. To deal with optical powers in the range of 10W and higher, Diamond offers a contact solution as a reliable alternative to fiber splices. High performance and connection robustness are achieved through optimal alignment of the fibers, pristine front-facet polishing, and enhanced thermal management inside the mating adapter. To allow for higher optical powers at the fiber-to-air transition, the fiber is end capped by splicing a glass window that is encapsulated inside the connector’s ferrule. This results is a non-contact configuration where the beam will then diverge when propagating into free space. This solution can be applied bi-directionally. For even larger beam expansions, the fiber beam is enlarged and collimated by a ball lens placed inside the connector’s housing. The pointing direction of the exiting beam is controlled by an accurate centering of the fiber with respect to the lens. The divergence or convergence of an optical beam at the fiber-to-air interface can be controlled by adjusting the length of the GRIN lens that can be spliced to the fiber. The position of the focal point and the beam waist may also be adapted to the customer’s needs. When coupling very high optical powers from free space to a fiber, extreme care must be taken in regard to the thermal management associated to the dissipation of the uncoupled or radiated light. Robust connector’s geometries and accurate positioning of the fiber are key to efficient power coupling. Fiber beams can be reshaped in free space by the correct choice of a rod lens placed in front of either SM or MM fibers. Collimating or refocusing arrangements may be provided according to specific applications.